Wow. This weekend was a whirl wind. In the past four days our home has gone through an amazing transformation. Basically, we are transitioning our home to a house the next owner can envision their things in. My dad came down for a couple days to assist us, and he was a great help. The biggest change was our guest bathroom. Do you have one of those rooms you know you should repaint, but can't work up the energy to do it? The guest bathroom was that room for us. This picture was from our first Christmas in the house. 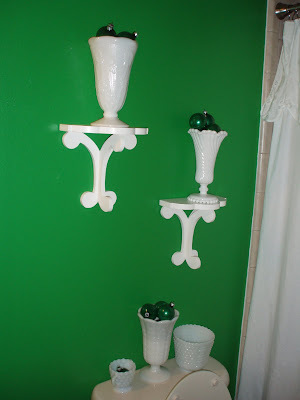 I had wanted a bright color to contrast with our white milk glass vases we used for our wedding. This is the only color in the house Todd had most of the say on. He loved the name, par four green. It literally reflected off of the other fixtures in the bathroom, but in the four years we've owned the home, we never changed it. Well, this weekend it finally happened. Hopefully, the future owner will appreciate a relaxing neutral in lieu of the bright green. Courtney!!! You are the one with the beautiful baby...loving all your things..such beautiful work..It takes me awhile to get all the names straight . Thanks for posting your stuff to flickr! !